Brainwashed - Himukalt, "Knife Through the Spine"
Himukalt, "Knife Through the Spine"
Ester Kärkkäinen’s 2016 debut as Himukalt, Conditions of Acrimony was an extremely impressive release that featured some excellently dark moments within ambiguous noise compositions. 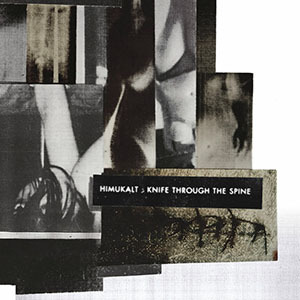 For her first vinyl album, Knife Through the Spine, she has fully embraced the early 1990s power electronic scene, creating a dark, disturbing, and at times extremely aggressive record that has a tighter, more specific focus in its sound. However, her unique take on the style, as well as her nuanced approach to creating music results in a fresh, unique release that sounds like no one else. The commonalities with artists such as the Grey Wolves and Con-Dom are apparent immediately on this record, not just on the sound but the art and presentation as well. Kärkkäinen's use of malfunctioning photocopying technology as a visual artist results in an aesthetic that is nicely consistent with those harsh post-industrial albums on labels such as Tesco Organisation. However, the overall feel of Knife Through the Spine is distinctly different. Rather than intentionally confrontational political ambiguity or serial killer worship (both of which are beyond trite at this point), Himukalt's sound is more personal and any sense of violence is more self-inflicted in nature. The depressive mood is akin to Maurizio Bianchi's early work, and the more violent outbursts are complementary to the bleaker, harsh moments in Atrax Morgue's discography. "I'm Afraid" gives a clear power electronics feel from its immediate pulsating electronics and shrill grinding noises. The rhythmic, yet heavily distorted backing nicely complements Kärkkäinen's vocals: a manic, heavily processed and flanged outburst that gives a nicely old school feeling while being almost completely indecipherable. However, her balancing of the harsher moments with some ambient and nearly silent passages adds an additional sense of depth and variety that makes it a stand out. "Social Anxiety #1" is another example of this, with her mangled voice and power drill like crunch piercing through loudly amidst desperate, heavily treated voices. It comes together as an unsettling, organic cascade of heavy electronics and rumbling subbass. The complementary "Social Anxiety #2" continues the bad feelings via ripping buzz saws and droning, sinister electronics. Again the final result is an uncomfortable, unsettling mass of unpleasantness that congeals perfectly. Himukalt’s work also excels due to her sense of dynamics and variation. Instead of just a dull, punishing roar from beginning to end, the shifts are more manic depressive in nature. Squelching electronics and buzzing harsh rhythms punctuate "Staggered, Crushed", but her blending of these harsher outbursts and tenser, less explosive sounds make for an excellently unsettling pairing. "Be Sure of Your Diagnosis (Version)" is another example of this, with shimmering noise explosions cutting through a hollow industrial din. Sputtering vocals help give even more depth to the whiplash stop/start structure of the piece, and as chaotic as it may seem, there is a clear sense of structure and organization. In just two years Ester Kärkkäinen has demonstrated impressive growth and change to her Himukalt project. Knife Through the Spine demonstrates some clear influences, but she takes the dark, harsh sounds in a different, more personal direction. Power electronics is a style I have been a fan of for a while, but I find it is often stale, and heavily focusing on the same, often juvenile, sense of provocation and controversy. It may sound like a callous statement, but Kärkkäinen's inner demons make for a more captivating experience on the listening end.